A cool breeze accompanied us this weekend at Farm School. The winds of change are ushering in the fall planting season. We start every session with a garden update. These 'maters are looking strong. While these little transplants do their thing to get big enough for repotting. (but they taste a lot better). and will soon be transplanted to the main garden. and are doing quite well. The Red Caribbean is the primo variety of papaya. Faye & Lynn will be selling these as plants at the farmer's market before long. I am beyond thrilled to say that the peas are up! in hopes that we will soon be enjoying these sweet and juicy tidbits. since 2013 seed was used. Seed from the previous year had not fared well. The gorgeous leeks are growing a bit bigger every week that I visit. Some of the New Zealand spinach is coming back with very little effort. but look out once it gets going! There will be more than even Popeye can eat! Tools were readied for transplanting lettuce to bigger pots. so time is not wasted running back and forth for supplies. but we're hoping that giving these little guys some shade will help them. We've shown the method used here before. Lynn has cut these plastic rings to size so that weeds are almost non-existent. We use the hole to center the transplant. Here's a close-up of the nail we use to find our center. Then the soil is removed around the nail. with the top just above the soil in the pot. The soil is replaced and gently nestled around the seedling. Then we put the plastic cover back on over the plant. Lynn waters in well from the lowest part of the pot. Just enough water is used to saturate the roots from the cell pack. A few basil were also potted up. (one piece of 20% cloth doubled over). of our still summer-like sun. to protect from any pounding rains that might damage their tender leaves. Another crop transplanted today was eggplant. The same method is used for all the crops here. Hey, if it works, why mess with it? the eggplant were looking a bit wilted by the time we got to them. Lynn used his wire supports featured here last week. to prevent damage to the seedlings until they are stronger. This was found in one of the pots being readied for the transplants. It felt spongy, almost like a tiny rubber ball. You'll find these cool and helpful critters skittering all over the place. may not be such a welcome addition to the garden. They prey on earthworms, as well as other insects. Overall, we got a lot done in a few hours. Productive days like these just do my heart good. restores my spirit in ways I can't explain. Here's what once was a palm tree. It was lost during a storm and this remains. 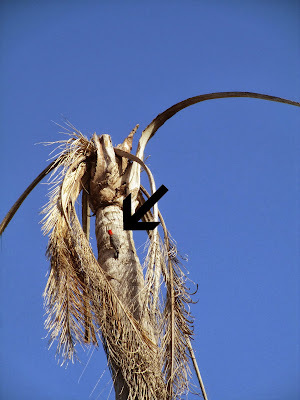 Faye told me palm trees are very porous. This is the amazing bark of a crape myrtle. Another wonderful day spent with two sweet souls. that God has put us together for this adventure. I, for one, am thoroughly grateful. "Today is life-the only life you are sure of. Make the most of today. Get interested in something. Shake yourself awake. you know that one of my steadfast dreams is to be a farmer. My friends Faye & Lynn are aiding me to that end. but our weather is slowly creeping toward more fall-like conditions. as is customary at the start of our sessions. The reseeded beets have officially made a comeback. They look so pretty all in a row. and they seem to be thriving with more room to stretch out. The lettuce transplants are holding their own. but a plastic tarp to keep the rain from damaging delicate leaves. Lynn took the plastic off earlier in the week. The beans were suffering from some type of rust. They were treated with copper. The peas are looking spectacular! You can't know how excited I am to see these beautiful green gems! they germinated very well and are growing straight and strong. While reseeding, we looked for signs of trouble. 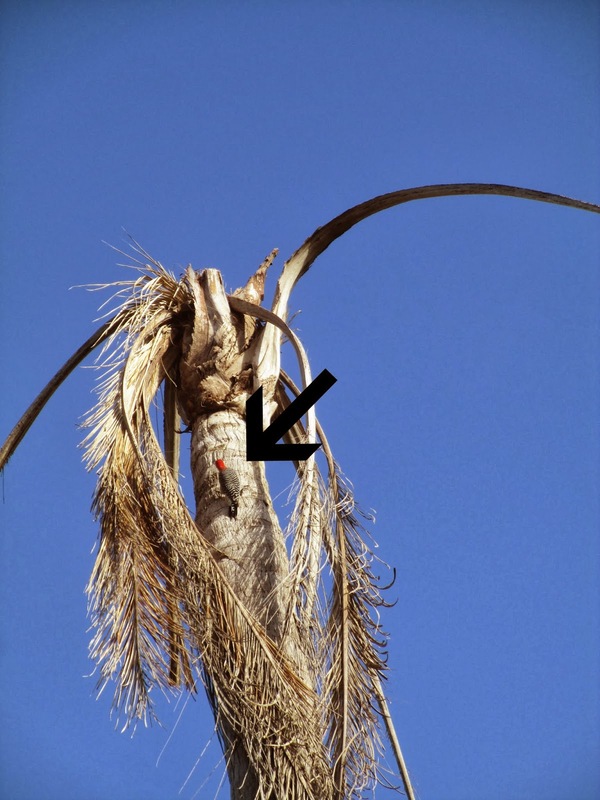 The discolored spots on the leaves are the telltale signs of a harboring critter. and hand-picking is the preferred method of pest control. The New Zealand spinach seems to have been hosting some type of worm. They are sometimes found under the plastic covers where they lurk until discovered. We planted more of this wonderful lettuce substitute. Lynn had soaked the seed for about 24 hours. The soil inside the premade hole was scratched to loosen it up. These tweezers aid in precision planting. The seed is planted with the pointy side down. We put three seeds in each pot. The tomato crops are faring well and sporting new flowers. It was a picture-perfect day for farming. motivated us to complete many tasks on Lynn's lengthy list. We harvested, then spread out some basil seeds along the fence row. We got some lettuce seeds started. so we were ready to go gangbusters. for a grand total of 432 possible seedlings. Having the right tools sure makes the job a cinch. This is the flower of the carambola tree. Another season and so much more to learn. and added determination to be a part of something bigger than myself. We're growing food here, people! has found its way to us at last. and a pleasant, refreshing breeze. Farm School started with our usual tour of the past week's progress. with more sure to follow. although worms can still be a problem. They are checked every few days for unwanted visitors. Dirt was added to the leeks this week as stalks continued to reach for the sky . The Swiss chard that was sown recently is coming up strong.. This is kale, which was sown 3 seeds to a pot. It will be thinned out at a later date. is now repurposed for planting a new crop this fall. The Red Carribean papaya sold out at the farmer's market on Saturday. Don't worry, they got back up! These tropical beauties are relishing the sunshine. is faring well and shot up within a matter of a couple of days. however it is probably going to be calling it quits soon. as the pickled okra won't be gracing my fridge for much longer. The blooms are just lovely. and it won't be long until we are lil' ole pea pickers again. are now designated for more sowing of these sweet gems. all the way to my supper table. A load of dirt arrived last Monday. Here it is in its virgin form. What's affectionately known as "the critter"
magical mix of luminous loam. Lynn promised to show me the method soon. Last week, we had noticed some buds on the carambola tree. the beginnings of something incredibly sweet. Dozens of these clusters could be seen from our vantage point. Remember the Red Carribean papayas we talked about earlier? Some of the larger seedlings needed to be transplanted. Here are the tools of choice for this little endeavor. without disturbing the ones remaining behind to get bigger. He used the largest knife you see on the previous picture to make a clean cut. and into a more spacious home. so they were bare root planted. They will be kept in the shade and monitored often, looking for signs of shock. Pampering is employed as necessary. Here are the Red Carribeans all grown up. These lovelies are where Lynn acquired his seed. We also planted a few Medusa peppers that had popped up around the main plant in this pot. The Medusa is an ornamental pepper, but is edible. We explained the coring method of planting a few weeks ago. Today, we used it for the Roma tomato transplants we installed. and where you want to end up. A small reservoir is left to keep water nearest the roots. For a review of Lynn's tomato planting technique, read this. and help me make some fantastic gravy! Lynn and Faye tell me how much they appreciate my help each weekend. very unique and generous spirits. but I can never repay them for their benevolence. So much is going on right now in the garden. and a time for enjoying the fruits of our labor. May you be blessed with abundance in your garden today. The days just keep gettin' better here at Farm School. on some much anticipated and enjoyable tasks. As always, we started with an overview of this week's progress. Mmmmm, I can almost feel the juice dripping down my chin. The Romas that were transplanted a few weeks ago are looking pretty happy. This ensemble of tomatoes are in "Lynntensive Care". being babied until they are strong enough to grow with the big boys. and seems to enjoy the weather we're having. The arugula was covered with shade cloth as it was getting a bit too much sun. So far, lettuce has been slow to respond. but this variety seems to be taking off now. Can't wait to fill up my bag with fresh lettuce. New Zealand spinach is making a comeback. We tasted it just to make sure it had good flavor. This stuff is so tender it melts in your mouth. The key lime basil seems happy in its somewhat shaded spot. It doesn't travel as well as standard basils. Lynn experimented with a sprig to see if it could last if placed in water. Now they can take it to the farmer's market to sell. The okra's about had it. Some are still producing, but it's obvious that summer is when it thrives. Some of the eggplant are not growing as vigorously as hoped. The newer transplants seem to be faring better. Radishes have been sown, but these will not be for sale. Lynn deserves to keep some treats just for himself. Oh boy, does this sight do my heart good. Four to six weeks, and these peas will be gracing my salad. Today's a day I've been looking forward to since I began this journey. into the most luscious soil a seed could ever hope to wrap itself up in. It takes some peat moss. This brand specifically is recommended by Lynn. This stuff is so compacted into the bag. But it works some serious magic in this mixture. This is a screen that Lynn made out of an old crate. The filtered peat is kept in these galvanized garbage cans. allowing the refined peat to fall into the can. What's left is hard bits of peat, twigs and other debris. This is what it looks like when the mission is complete. Light, airy and ready to join the soil extravaganza. The pulp that is left over will efficiently be used as mulch. Last week, we introduced you to "The Critter". Today we get to see it in action. out comes this magical medley of luscious loam. Designated storage pots have had the drainage holes covered with duct tape. Lynn adds his plastic rings (without the middle hole) to these until they are used in the garden. That keeps debris out and too much rain from compacting it. These were a curiosity when I spied them. Imagine my surprise when Lynn showed me their origin. The seeds drop down into the pots and start growing a stem. They root themselves and start sprouting leaves while the seed is still connected. The seedpods start out as a bright orange globe. Four more rows of peas were added to the vast array. You won't hear one complaint from me! so hopefully, we'll have peas comin' out of our ears! knowing that our work has value. We're findin' our groove this week at Farm School. The flags indicate where fruit has been spied. They are looking strong despite being visited by worms. Every few days the lil' buggers are hand-picked off of the crops. and joined the Red Carribean papayas in full sun. Lynn found 1,000 feet of extra groundcloth. After all, we can't waste all that wonderful space, now can we? The arugula is growing taller every week. This lettuce is holding its own right now. It's the first of the lettuces to get this far. Lynn needs to order more seed. They will be ready for harvest very soon. The peas we sowed last week just made my heart sing. and not much reseeding will need to be done. and it's one week closer to having them on the table. That's a whole mess of peas! I just love visiting Peaville. Eastern Black Swallowtails are here in droves. I brought home two full jars to offer up on Craig's list. 'cause they'll eat all the parsley and dill they can get their little hands on. We used plenty of the soil that we mixed up last week. and Pioneer Day later in the month. Ever seen a sausage tree? We first talked about it here. It's not edible, at least not for humans. This species is indigenous to Africa. This is a Yankee Magnolia. and a subtle sweet scent. A burn pile was started to clean up some of the debris on the property. Lynn calls the Division of Forestry to get a burn permit. a burn ban may be in effect. So far, fall has been nothing less than spectacular. The plants seem ready to show us their stuff. It's only a matter of time before we're eatin' like kings (and queens). The fall garden is gettin' busier every week. We start each workday with a tour of the garden. The 'maters are abundant and healthy. Oh, it does my heart good to see everything growing in 'Materville. These gems will be ready in a matter of weeks. Last week, we talked about how Lynn added another 1,000 feet to his garden area. The entire growing space now takes up over 5,000 feet. Collards are being started for the first time. Broccoli starts are doing well. Faye & Lynn have a keen eye for spotting critters. Lynn's growing radishes for himself. These babies have taken no time at all to grow to maturity. They should be ready to harvest next week. are standing out in the full sun and getting bushier. The peas we sowed had a 95% germination rate. we should be eating peas for a while. We transplanted more lettuce seedlings to bigger pots. It's been too long since I sampled their delicious salad fixins. the date of seeding, and the date of transplant. 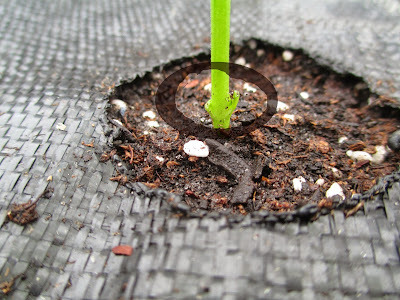 After transplanting, the seedlings were placed under shade cloth. Protected from too much sun, we are hoping they will grow and prosper. Another unwanted critter was found. 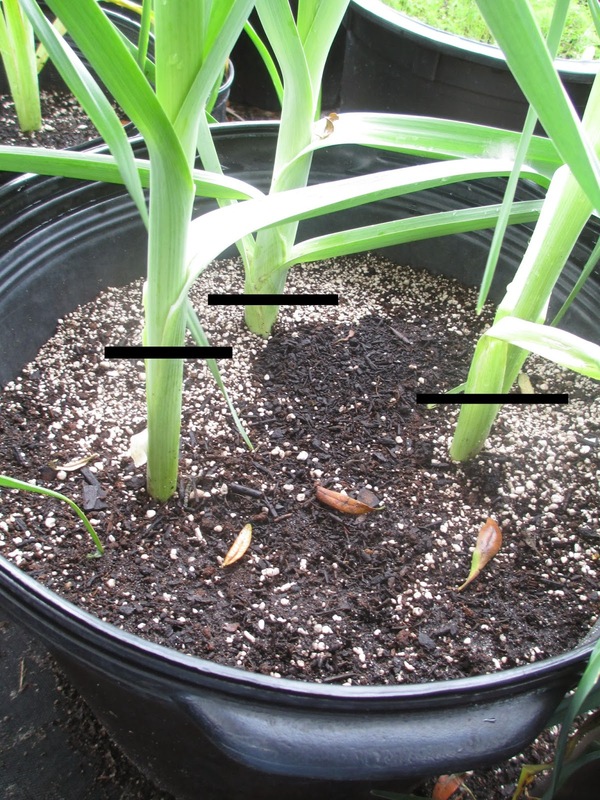 Plants are checked regularly and pests are hand-picked. over on the new part of the garden. We sow 7 seeds to a pot. So far, the Roma tomatoes are faring well. This is the first time this particular variety has been grown here. This Key Lime basil was a big hit at the farmer's market last weekend. We took some of these shoots out and gave them their own pot. They'll stay in a shadier part of the garden until they are a bit stronger. The carambola should be ready very soon. The trees are loaded with flowers and clusters of fruit. Lynn spotted this gopher tortoise that visits them frequently. What a sweet lil' thing. We accomplished quite a bit on this overcast day. it would be great to have more time to spend at the farm. We're back on track with Farm School. What a lovely day we had. it was the perfect day to be outside. We live for days like this. Our tasks began with the tomato patch. We needed to do what Faye & Lynn call the "tomato tuck". while making it easier to navigate between the rows. Faye's keen eye spotted this guy. It's a tomato horn worm and he is most certainly not welcome in the tomato patch. It is actually the larvae of the sphinx moth. Fortunately, he didn't get to these yet. It won't be long before we're enjoying these juicy tidbits. These eggplant were ready to be caged. so the cages are instrumental in nurturing a sturdy plant. Another luscious jewel to look forward to. All the radishes were harvested. These little gems only take a few weeks to fully mature. but they sure pack a punch! Spicy like you wouldn't believe. The dill is having a good time filling out in this pot. We did a bit of "tucking" in "Peaville" as well. The Simpson Elite lettuce is going gangbusters! Some of this made it home with me today. The datil peppers are growing strong. (okay, a LOT of heat). Another great learning session today at Farm School. I feel so blessed to be able to witness the garden coming into another season. and a myriad of welcome experiences. My time here has allowed me to become a more confident gardener. for which I am immensely grateful. Farm School is in full swing. We're busier than ever and lovin' every minute of it! Our day began with a check-up on the goings-on in the garden. The Swiss Chard is slow growing. are placed on the ground to be reseeded. I was happy to hear Lynn say they are slow to reach maturity. Most of his are doing better than mine at home. His germination rate is pretty doggone good. These jewel clusters are a sight for sore eyes. Can't wait to use some of these to make some homemade gravy. It won't be long until we are sampling these tender morsels. Folks at the farmer's market are already clamoring for them. although Lynn hasn't quite figured out why. The first four rows in the foreground were planted on the same day. looked "anemic" according to Lynn. The couple of rows further in look lush, green and healthy. bolted with the warmer temperatures this past week. Thankfully, there are seedlings ready for transplant to begin a new crop. A few of the established eggplant are showing signs of production. Lynn added these rods for extra support during windy days. so that they don't have to be disturbed later. Lynn uses bricks or nails to anchor the plastic rings in his pots. He recently realized that he could also use these stakes to keep them in place. Crops are checked daily for critters like these. Isn't this lil' guy amazing? Today we also transplanted several types of lettuces. This is Romaine, one of my personal favorites. Here's the method that we use on the Farm. A single nail is placed in the center cutout of the plastic ring. and a hole is dug around the nail for the new seedling. and gingerly placed in the hole. The plastic ring is then replaced over the seedling. We try to center the plants in their new home. only 2 nails are needed to secure the plastic cover. We work assembly-line style until every transplant is happy in its new spot. Water them in well and send them some love. The sides of pots are the perfect hideout for this notorious creature. as well as more eggplant seedlings. there are always extra transplants to ensure production. A few green tomatoes were picked before the horn worms could get to them. Faye & Lynn will be enjoying fried green tomatoes this week. We hope that you enjoy the Farm School Series. a sense of responsibility to nature and an appreciation for learning. It was a picture-perfect day at Farm School this week. we were able to have time to enjoy the work that needed to be done. Someone had other ideas about how to appreciate the day. We did our usual check on established plants in the garden. Some beets were reseeded this week and are sprouting up. Worms are the big enemy, and they have been busy in this crop. Two kinds of kale are grown here. and the one further back is the dinosaur variety. These are hearty plants that will not be affected by the colder weather approaching. Did you know that kale provides more iron than beef and more calcium than milk per calorie? It's a true superfood, with many health benefits. The papayas are being used in a little experiment. to lure away the tomato hornworm. They enjoy papayas even more than tomatoes. They also enjoy peppers, eggplant and potato leaves. These beautiful Romas have been staked to add support. although they were all started at the same time. We'll see if it affects production. much as you might hill potatoes. Banking is done once they reach at least the size of a pencil. Today we worked on getting a ton of lettuce potted up. including Romaine, arugula, Red Salad Bowl and Buttercrunch. It won't be long before we are sampling a big bowlful of sunshine! Broccoli is looking good and should start producing fruit soon. Brussels sprouts have been repotted in their permanent home. This is another cold tolerant plant that is low maintenance. with the leaves and fruit forming a spiraling cascade. Eggplant is producing and looking mighty fine. I hope to be making Mimi's ratatouille with this soon. We worked on tidying up the ends of the tomato garden. These will soon be covered with netting, to keep the birds away from the fruit. Lynn has his own method of tying baling twine on the ends of these posts. They are easily removed with one tug. It's nice to have it all tucked in. but only got the very tip of her red beak. there are a wide variety of birds in this enchanting wonderland. Many critters call this home. to see what they morph into. he will know which critter he is dealing with. What a fascinating way to study nature! The morning breezes by, creating a sense of fulfillment like no other. This garden has truly blessed me with so many gifts. Blustery was the word of the day at Farm School this week. we had cooler temperatures and overcast skies. Perfect conditions to complete our tasks. The overview of the garden showed that the new expansion area is filling up fast. Lynn recently added 1,000 square feet to this side of the garden. Two types of kale are grown here. the Dinosaur variety further back. This is one of the crops that does best in cooler temperatures. The Romas are looking promising. Each plant has a multitude of clustered gems on the vine. We've tried to grow these previously without much success. These are just weeks away from harvest. This little beauty came home with me. The lettuce is getting close to being ready to pick. Three types grow here, including (from front to back) Simpson Elite, Romaine and Buttercrunch. The broccoli is starting to show its stuff. Here's a newbie popping out of the center of the plant. While this cutie is a little farther along. and are harvested as a bonus crop. This plant just keeps on giving. for those who want to start their own patch. Radishes germinate within days of planting and are harvested in a matter of weeks. We checked on "Peaville" to see how the plants are doing since being fertilized. Seems they responded well and are looking healthier. We sampled a few peas on the older plants and were pleased with their flavor. Some are unable to contain themselves within the growing area. This new batch was planted just days ago. You won't hear me complaining about too many peas. We'll need to reseed where some didn't come up. This is hands-down my favorite task at the farm. The okra is still putting out a smattering of veg. We managed to harvest a handful to fill an order. but as they are diminishing in production, we'll take what we can get. These will be pickled . We worked on sowing more lettuce seeds today. These tiny seeds are best planted by using these handy-dandy tweezers. One seed per cell is sown in these six-packs. That's over 200 plants comin' our way! Get the ranch dressing ready! to settle the seeds and close up the planting holes. This knife gingerly pressed on top ensures that they are snug as a bug. and they are monitored carefully for light, moisture and air circulation. Lynn calls this "Seed Central". He's got his own way of organizing the many varieties he uses. Lynn decided to start some cucumbers in this area next to the fenceline. They will be grown vertically. He calls it "Cucumber Alley". "Burpless Beauty" and "Salad Slicer"
We scratched up the dirt and planted away. but Lynn enjoys pushing the boundaries whenever he can. And what it does for my peace of mind is even more incredible. I always leave feeling centered, fulfilled and renewed. Ready to face the challenges of the week ahead. Hope you have something that feeds your spirit. But Farm School always puts a smile on my face. The garden is filling out with new transplants and seedings completed daily. Our check on the garden found the brussels sprouts doing well. I can hardly wait to see what these babies do! I could just drool spying the luscious eggplant. And yeah, it tastes as good as it looks. including peas that were recently planted. You'll notice the lettuce on the lower left-hand portion of the photo. You know that went home with me! The Romas are slow in coming along, but the crops are loaded with fruit. I know they'll be worth the wait. Our first goal was to transplant this slow-bolt cilantro into larger pots. Lynn had recently mixed up some of his super soil mix. We fill the pots to overflowing to accommodate the settling that is sure to occur. and this batch will follow up behind it. Broccoli takes about 2 months from seed to harvest. we transplanted these gorgeous banana peppers. They will no doubt appreciate the added room to grow. The planting depth is measured using the trowel. We start at the bottom of the rootball and stop at the first set of leaves (where you see my gloves). This gives the plants ample support because so much of the stem is in the ground. The first leaves (or dicots) are removed. The soil should come just up to this point. Ain't that a perty sight? It was even more peaceful here than usual this week. enjoying the songs of a variety of wonderful warblers. The overflowing bags of lettuce are a welcome treat. but the tomatoes are SO good, I don't think they'll last! Farm School is a busy place this autumn. It was a gorgeous day for workin' outside. The garden is overflowing with gifts. These beets will soon be ready for harvest. Lynn's vigilance with his frequent "worm roundup" is paying off. Broccoli is coming along quickly. This fresh head will be picked for a customer today. The cucumber seeds we planted a couple of weeks ago are showing themselves. Did you know cucumber could be grown this time of year? I love planting this stuff! Wish you could taste how juicy and sweet these babies are. as can be seen here on the lower portion of the plants. They're bearing fruit and so far, the birds haven't found them. These delicious morsels are so succulent, sweet and have very low acid. I love making tomato and mayo sandwiches with 'em. The Romas seem to be faring better. They do not seem to be plagued with the same problems found on the Celebrity crops. but you'll notice the one on the left is taller and more vigorous. while the ones on the right are in 20-gallon. We were able to take a few starfruit home with us. The lettuce has been divine! It's doing well, even when the temps climbed over the past two weeks. Plenty more seedlings are being pampered for future harvest. The leeks are getting some size on them now. The New Zealand spinach is starting to explode! Our major task for today was to plant onion sets. Lynn uses these two tools to do the job efficiently. where he wants the onions to be under the soil. The extra-long tweezers aid in getting them right where he wants them. to enable the sets to fit right in there. which we featured on the blog a while back. The root end goes down. Starting with the center hole, each pot is planted. We used a beet stem to mark the starting point. This task requires mindfulness so that only one set is planted per hole. It's easy to lose one's place while completing this activity. You can see how handy the tweezers come in when you need to get down 7 inches. It really pays to have the right tools. Here's how the pot looks when all the sets are in. I really should be paying an entrance fee to have this much fun. Can't wait to see how these beauties look when they come up! Lynn just gives them a spray with the hose and they are good to go. They won't be watered again until the crops pop up through the soil. We also seeded some kohlrabi to supplement the crops already started. It does well in the cooler months. The garden is buzzin' with excitement. Farm School this week had us trying to figure out the weather. with the promise of cooler temperatures overnight. These vultures decided to dry their wings on a nearby tree. The beets are getting closer to harvest time. Lookin' forward to that day! A bounty of broccoli lies before us. This beauty was brought home for Lil' Guy. to prevent disease from creeping in. The rainwater can run right off. The eggplant in the background isn't doing too well. so more of it will be started. Last week we showed you a unique way to plant scallions. The first little buggers are coming up already! Things in Peaville are lookin' fantastic! Lynn himself is surprised to see how abundant the crop is here. The plentiful blooms mean that a plethora of peapods are not far behind. We worked on extending the end posts to accommodate the stalks. prides himself on always being prepared. Metal stakes, removable tie wraps and baling twine keep these peas on the straight and narrow. They have ample room to grow. This was the first official pick of the season. Guess who got to take these little gems home? More peas in another patch are already climbing in the background here. Oh yeah, we'll be rich with sugar snaps for quite a while. Buttercrunch, Romaine and Simpson Elite. All tender, sweet and oh-so delicious. The leeks needed banking again. taking care to keep the soil out of the leaf folds. The cucumbers we sowed a few weeks ago are showing their first true leaves. We put up some hog fencing to support the vines when they get a bit bigger. so that the goodies just keep on comin'! Another salad variety, Red Salad Bowl has a good start. This is my very favorite of the varieties grown here. It feels good to accomplish the tasks Lynn has on his checklist. This garden is a remarkable place. The tender care it is given is evident in every mouthwatering bite.